Once the appointment of Imran Khan as the PM of Pak was confirmed, Modi called and congratulated him. As per the statement released by the Indian Government, Modi expressed hope that democracy will take deeper roots within Pak. He also reiterated his vision of peace and development in the entire neighbourhood. In contrast the Pak statement added that Imran stated that ‘solution to conflicts should be found through dialogue’. The Indian High Commissioner in Islamabad, Ajay Bisaria, met Imran Khan over the weekend, congratulated him on his victory and discussed bilateral ties with him. The Indian press release stated, ‘The High Commissioner briefed the PTI leadership on India’s concerns about terrorism and cross-border infiltration.’ He also gifted Imran Khan with a cricket bat, autographed by the Indian cricket team. The Pak statement on the visit stated that during the meeting Imran had expressed grave concern over ‘Human Rights violations’ in Kashmir. He had also hoped that India would agree to attend the SAARC summit in Islamabad later this year. Imran had raised Kashmir even during his first address to the nation. He had then stated, ‘There have been human rights violations for over 30 years and the people of Kashmir have suffered massively’. He added, ‘Right now it is (the situation) one-sided where India is constantly blaming us’. Considering protocol, it is essential for the Indian PM to call Imran and offer his congratulations, after all Pak is a neighbour, which cannot be easily ignored, as nations cannot choose neighbours, but must learn to live with them. Simultaneously we cannot go on making the same mistake again and again, seeking to move forward, desiring peace, only to be pushed back. While it may be early to deride the credibility of Imran and his government, however there are some clear facts which need to be assessed. Firstly, all important dignitaries visiting Pak, have their photo-ops in Islamabad, but main discussions in Rawalpindi. Secondly, the conduct of elections is indicative that the Deep State ensured Imran wins, pushing other major political parties into the wilderness. Hence, Imran would have no option but to toe their line. The emergence of terrorist turned political parties, nurtured by the Deep State, into the election process, all of whom promised support to Imran is indicative of the increased power and clout of the army. These groups are unlikely to be touched by the new Government as they and the PTI, Imran’s party, are all indebted to the army. Thus, the army now has a nation and it will be ruled from Rawalpindi, with Islamabad only implementing orders. India as a policy has never engaged with the Pak military, while every other nation, seeking Pak’s cooperation has adopted that route. As recently as June this year, the Afghan President called the Pak army chief and not the elected Government to convey the message of the elimination of the TTP chief by a drone strike. He has interacted mainly with the Pak army, ignoring the political leadership. As president, he has called on Rawalpindi more often than Islamabad. The same was also put out in a tweet by the Pak DG ISPR. Every single US diplomat who visits Pak to discuss cooperation in Afghanistan, spends more time in Rawalpindi than Islamabad. The US ambassador too regularly visits Rawalpindi. The decision to deploy troops in Saudi Arabia was not made by the political leadership but by the army chief, post his visit to Riyadh.Evidently, India too is aware, but for its own political reasons is unwilling to engage with it. By ignoring the military and interacting with the political leadership, despite the desire for peace by known politicians, nothing has ever moved on ground. Every major attack on Indian soil has been preceded by an attempt to peace. Vajpayee’s Lahore visit was followed by Kargil and Modi’s Lahore visit was followed by Pathankot, only conveying the message that the polity means nothing, if you desire peace engage, with the Pak army. Nawaz took a stand for improving relations, going against the strong conviction of the Pak army and was shunted out. Now that his party is no longer in power, would not return for at least five years, he may get bail, provided he promises to stay quiet and out of the limelight. The fact that infiltration continues,and India lost four brave hearts, whose last rites were still in progress, when Bisaria met Imran indicates that the Pak army has no desire to even contemplate talks. 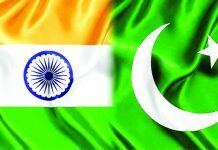 The Imran led Pak political leadership would continue harping for peace, seeking to project an international image of conciliation.It would blame India for the stalemate on SAARC. It would raise the Kashmir bogey in every forum, as it is the demand of the Deep State and of those ‘terror groups turned political parties’ which supported it. There would be no reduction in infiltration nor any progress on prosecuting those responsible for Mumbai or Pathankot. India is soon heading into the election mode. It therefore cannot risk even contemplating talks with Pak, the failure of which, could impact the standing of the present Government in the forthcoming elections. SAARC would also not see the light of day, at least not till mid 2019 when the next Government assumes office. As a policy, India would never engage with the Pak army. With this being the government’s stand, there can be no forward movement. Imran has been greeted, formalities done, now back to square one- battling infiltration and militancy.